High Speed Steel is currently considered to be the most advanced stainless steel on the market for high end kitchen knives. A particular significance is the high amount of Cobalt (8%) in the steel alloy which give it its high wear resistance and durability. It makes it perfect for use in its original purpose of industrial machinery, but also excellent in high end kitchen knives which require long lasting edge retention. It is not easy to forge kitchen knives with High Speed Steel and there are not many knife manufacturers that make the attempt. However, the end results are overwhelmingly positive if done successfully. A particular importance is during heat treatment when the steel reaches in excess of 1200 degrees Celsius. 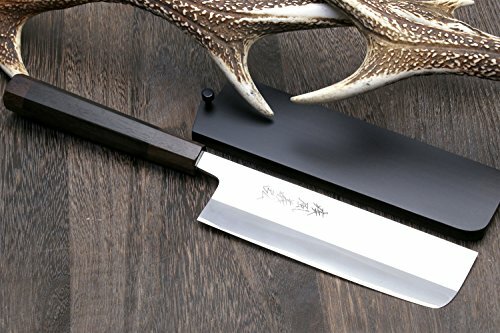 This temperature is extremely high even within forging handcrafted Japanese knives and combined with the state of the art steel, it is what makes the Yoshihiro High Speed Steel Gyuto its exceptional features. Our Yoshihiro HAP40 High Speed Stainless Steel Nakiri/ Usuba is a state of the art Handcrafted Japanese Vegetable Chefs knife. HAP40(Funmatsu Haisu) Stainless Steel holds the potential to become one of the best steels on the stainless steel knife market, maximizing cutting performance and edge retention like not many before. High Speed Steel are forged at extremely high temperatures to evenly disperse the metallic elements to create a steel composition that is durable enough to be used in industrial machinery and power tools. With a HRC Scale of 64-65, this knife will make and keep its superior edge for an extreme period of time. High Speed Stainless steel core is clad with a softer stainless steel, resulting in extreme toughness and unmatched edge retention, and comes equipped with a traditional Japanese Premium Ebony handle with double bolster. It is perfect for those professionals who have daily high-volume prep work for extended hours. HAP40 High Powdered Stainless Steel keep their sharpness longer than most traditional stainless steel knives (HRC 64-65). HAP40( Funmatsu Haisu) is a extremely hard blade and is highly stainless. Complimented with a traditional Japanese style octagonal Ebony wood handle for a durable yet balanced and comfortable grip.